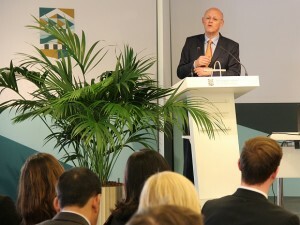 On April 15, 2015, The Hague Institute for Global Justice hosted an official side-event to the 2015 Global Conference on Cyberspace (GCCS) in partnership with the Observer Research Foundation, which is based in New Delhi, India. The side-event began with an expert roundtable discussion and was followed by a public panel discussion on the theme ‘Reconciling Policy Priorities of the Global North and South: Implications for Norms of Responsible State Behaviour in Cyberspace’. The morning session of the roundtable was dedicated to discussing how norms are created and how to harmonize state behavior in the field of cyber security. Experts from the Global South and Global North agreed on the idea of cyber stability as opposed to cyber security and acknowledged that the private sector is already driving norms. More mixed views emerged about the role of the state and attribution of malicious behavior in cyberspace. The afternoon session was dedicated to discussing human rights in regards to cyberspace, including issues of universal access, net neutrality, intellectual property law, and freedom of expression as the main source of debate. The idea that cyberspace is not a lawless domain – a “Wild West” – in view of existing normative frameworks such as the Universal Declaration of Human Rights as a baseline standard came to the fore of the discussion. The public panel included four esteemed speakers: Ambassador Latha Reddy (Former Deputy National Security Adviser of India and Member of the Global Commission on Internet Governance), Dr. Alison Gillwald (Executive Director, Research ICT Africa), Ms. Marília Maciel (Researcher/Coordinator of the Center for Technology and Society, Getúlio Vargas Foundation (FGV)), and Mr. Robert Morgus (Program Associate, Open Technology Institute, New America). The panel was moderated by Mr. Samir Saran of the Observer Research Foundation. The discussion took a closer look at what it means to be a ‘swing state’ in cyber governance and how countries such as India, South Africa and Brazil add to and shape the global debate on state behavior in cyberspace. During the discussions on the changing landscape of cyberspace and the role of states within this landscape, the idea emerged that not all swing states have equal impact and swing states themselves are prone to change over time. For instance, whereas the once far-ahead cyber capacity of South Africa held sway, it is now states such as India which take the lead as emerging new powers, with a vast growing network of users expected over the next decade. The 2015 Global Conference on Cyberspace was hosted by the Kingdom of The Netherlands and convened in The Hague on April 16 and 17. Hundreds of stakeholders convened to discuss highly debated cyber-related issues, the solutions to which require input from civil society, governments, specialists and the private sector. The global conference, hosted at the World Forum, centered on the three core themes of cyber security, freedom and growth. Researchers from The Hague Institute participated in the GGCS. In particular, they provided input to the GCCS Chair’s Statement, relayed key findings of the side-event to a panel ‘Norms for International Peace and Security in Cyberspace’ organized by the ICT4Peace Foundation, and took part in the subsequent ‘unconference’ entitledGCCS-Unplugged.